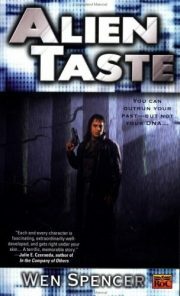 2001’s Alien Taste is the first volume in Wen Spencer’s Ukiah Oregon series. Tasked with a search for Doctor Janet Haze, an apparent kidnapping victim whose three roommates have been brutally murdered, Ukiah finds himself face to face with the woman he set out to rescue. She has not been kidnapped; in fact, she is the one who hacked her roommates to pieces. Ukiah barely survives his confrontation with Haze. She does not. Haze was definitely a murderer … but it seems that she was also a victim, driven mad by an insidious attack. An attack, Ukiah will discover, that is intimately connected to the mystery of his own origin. 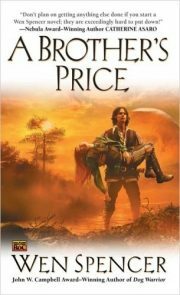 In the world of Wen Spencer’s 2006 A Brother’s Price, a world where male babies rarely survive to term, young men of breeding age are a valuable commodity. Jerin Whistler is more valuable than most; he comes from gentry and is good-looking as well. That’s lucky for his sisters, who can trade him off to buy a husband of their own! The body in the creek complicates their plans immensely.